How you manage your time determines the value you generate for yourself, your customers, and your company. You’ve most likely taken a time management class or two and yet you still end the day with more on your to-do list then when you started. If this is so, read on to discover how executives manage their day to accomplish amazing outcomes. Do you believe that? If you’re like 99% of the people I talk with, you do. And it’s a near unshakable belief. This is absolutely true if you’re personally selling time. Yet, as an executive, you aren’t paid for your hours, you’re paid for your outcome. This causes the cognitive dissonance from hourly paid people who exclaim in astonishment, “How can anyone be worth $5 million a year? That’s $2,500 an hour! Nobody should make that!” That may be true for most people selling time. Yet executives don’t sell time. The executive reality: value creation is money. Executives are paid for the value they create not the time they use. I admit it. This article is a bit of bait and switch. It’s not really about time management. 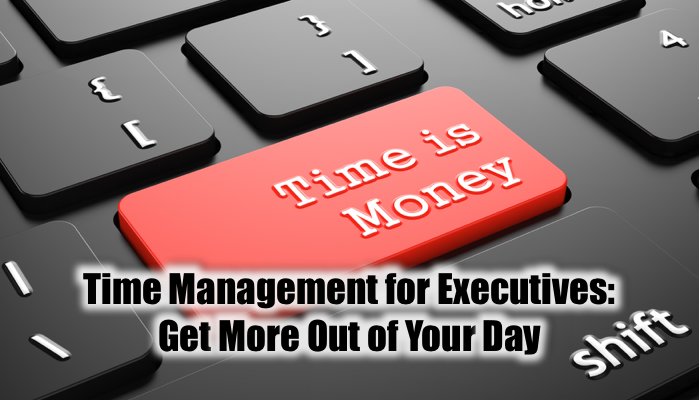 Executives don’t use time management like the rest of your organization, instead they focus on demand management. They consider the demands from their Board of Directors, their vision, and their direct reports, and then make a decision about where to apply their attention and resources. An executive’s most valuable resource is cognitive capacity. Executives get paid because of their ability to create systems, troubleshoot problems, and direct resources to create the outcome as approved by the Board of Directors. The bulk of an executive’s work is think time, providing direction, and leadership activities. Executives schedule time to perform high value work during their high cognitive timesand they refused to do any low cognitive tasks when they are in full brainpower. They then use low cognitive times — where they aren’t as sharp or are tired — to play and rest. During these times they focus on nutrition, exercise, and recovery to return to full cognitive capacity as rapidly as possible. Sometime management experts advise against merging your calendar and to do list. Executives ignore this advice knowing that their calendar represents their times of peak cognitive capacity and so schedule activities in those time slots. Executives schedule attention to outcomes. They work on tasks that relate to improving the productivity and efficiency of the organization because efficiency allows them to make more profits for the same sales volume and enables them to grow the company without additional capital investment. They schedule time to innovate the product, sales, marketing, operations, financing, strategic planning and leadership activities. And they schedule conversations to support those particular outcomes. Executives have a don’t-do list, whether it’s a written list or mental list. They refuse to do anything for less than their hourly value. If they can get someone else to do a task for less than their hourly value, they delegate because it’s not the highest and best useof their time. Calculate your hourly rate by dividing in your income by 2,080 — the number of work hours in a year. For example, if your hourly value is $1 million per year, don’t do any work that’s worth less than $480 per hour. There are exceptions to this rule. If you’ve made enough money and you have a task that’s fun for you to do, go ahead and do it. If you wish to perform service to your community, to your family, or to your tribe and it makes you feel good, by all means do it. And of course, you don’t apply this principle to anything that you do with — not for — your friends and family. Let’s have a conversation about strategic planning, marketing plans, executive coaching, and customer acquisition systems. Find a mutually agreeable time at MarksSchedule.com or contact me.